As mentioned above, in order to examine effects of reflectors' array on the IACC for the 2000 Hz range at 15 seating positions shown in FIGURE 6, measurements were performed with and without reflectors above the stage. 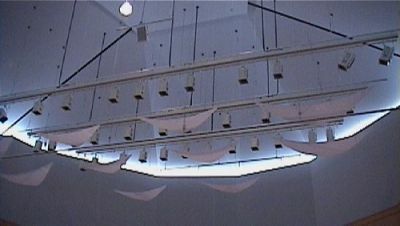 As indicated in this figure, the location of the sound source is marked by a star, and triangular reflectors` arrays  are installed above the stage. FIGURE 7 shows the measured results of the IACC without reflectors, and FIGURE 6 shows those with reflectors` array. The IACC values of the 2 kHz-frequency band for a real room were measured at the 20 kHz frequency band in the 1/10 scale model. As shown in these figures, the reflectors decrease results of the IACC at the 9 measuring points, so that acoustic quality is much improved. Especially, the decrement of IACC values was remarkable in the frontal area close to the stage in audience floor except for the center, due to the reflections from above the stage to the listeners. M. SAKURAI, S. AIZAWA, Y. SUZUMURA, & Y. ANDO (2000). 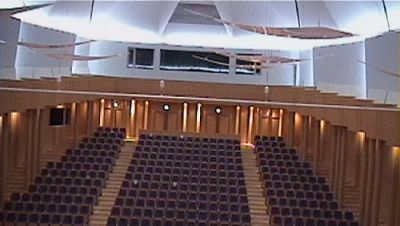 A DIAGNOSTIC SYSTEM MEASURING ORTHOGONAL FACTORS OF SOUND FIELDS IN A SCALE MODEL OF AUDITORIUM, Journal of Sound and Vibration, Vol. 232, No. 1, pp. 231-237.